It is no wonder, then, that we find sophisticated agriculture systems in some ant species. 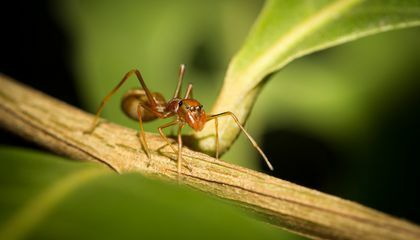 At the pinnacle of farming abilities are the famous leaf-cutter ants, who cultivate fungus gardens as a unique food for their colony. Like us, they prepare "soil" (leaf cuttings), plant, weed, fertilize and protect their gardens from pests. Each ant has its own job, with tiny ants tending the gardens and feeding the larvae, while larger ants bring leaf cuttings and defend the nest from intruders. While their agriculture may seem tiny in scale compared to ours, a single leaf-cutter ant nest may process as much vegetation as an adult cow. They are major ecosystem engineers, cropping leaves and recycling nutrients into the soil. And, to ants, sustainable agriculture comes naturally. 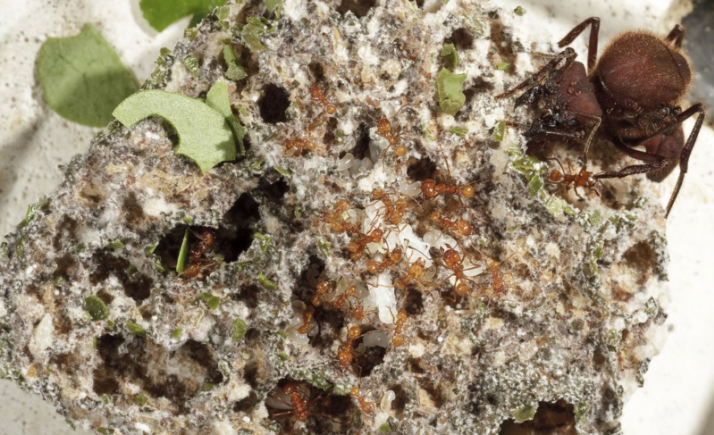 Waste from the garden is carried to a compost pile by designated ant workers and regularly mixed by other ants to speed decomposition. What characteristics have allowed ants to become successful farmers? Find out more on Thursday, December 10, 2015, in a Smithsonian Science How live webcast on The Evolution of Agriculture in Ants (airs at 11 a.m. and 2 p.m. EST on the Q?rius website). Entomologist Dr. Ted Schultz from the National Museum of Natural History will appear live to discuss and answer questions. Get teaching resources to support your webcast experience. I didn't know that ants were that productive and that they were that smart. I always though they were just annoying little pests. I didn't know that ants were this smart! It seems they can be smarter than us when it comes down to agriculture. I really like that ants can create their own, tiny version of a civilization. Ants have gotten a head-start at farming ever since the dinosaur days, they might've even been the first creatures to begin agriculture. Why have ants been farming longer than us? well there's the simple answer that they've been around longer than us and well the live for farming, but there's also the fact that they're bodies are made for farming its all they do. The world is too naive to know that like humans, animals are also intellectual. I found it very fascinating that not only that they are intelligent, but they have also figured agricultural techniques in comparison to us humans. I would have never figured that they not only farm, but they also developed fertilizing techniques. By reading this article it shows how even animals can help us out in the world. These ants been doing like forever now and by us always take away land it this can affect us. Ants were on the Earth way before humans were. With them being on the Earth before humans, they were able to start innovative their agricultural techniques about 55 million years ago. With them being able to have farm way earlier than humans, they created better and more efficient techniques. I absolutely hated ants before reading this. Its amazing to be able to see that they actually serve a purpose other than to get in my food during the summer. They will still be annoying pests but now, I guess, they aren't as bad. I honestly didn't know ants were capable of doing all those things. It amazes me that they can cultivate fungus gardens for their colony food and prepare and protect their gardens or have their own job. As little as they are, I wouldn't think they could process as much vegetation as an adult cow. I think it is cool how it all comes natural to them.